We’d love your help. Let us know what’s wrong with this preview of The Essence of Chaos by Edward N. Lorenz. Chaos surrounds us. Seemingly random events -- the flapping of a flag, a storm-driven wave striking the shore, a pinball's path -- often appear to have no order, no rational pattern. Explicating the theory of chaos and the consequences of its principal findings -- that actual, precise rules may govern such apparently random behavior -- has been a major part of the work of Chaos surrounds us. Seemingly random events -- the flapping of a flag, a storm-driven wave striking the shore, a pinball's path -- often appear to have no order, no rational pattern. Explicating the theory of chaos and the consequences of its principal findings -- that actual, precise rules may govern such apparently random behavior -- has been a major part of the work of Edward N. Lorenz. In The Essence of Chaos, Lorenz presents to the general reader the features of this "new science," with its far-reaching implications for much of modern life, from weather prediction to philosophy, and he describes its considerable impact on emerging scientific fields. Unlike the phenomena dealt with in relativity theory and quantum mechanics, systems that are now described as "chaotic" can be observed without telescopes or microscopes. They range from the simplest happenings, such as the falling of a leaf, to the most complex processes, like the fluctuations of climate. Each process that qualifies, however, has certain quantifiable characteristics: how it unfolds depends very sensitively upon its present state, so that, even though it is not random, it seems to be. Lorenz uses examples from everyday life, and simple calculations, to show how the essential nature of chaotic systems can be understood. In order to expedite this task, he has constructed a mathematical model of a board sliding down a ski slope as his primary illustrative example. With this model as his base, he explains various chaotic phenomena, including some associated concepts such as strange attractors and bifurcations. As a meteorologist, Lorenz initially became interested in the field of chaos because of its implications for weather forecasting. In a chapter ranging through the history of weather prediction and meteorology to a brief picture of our current understanding of climate, he introduces many of the researchers who conceived the experiments and theories, and he describes his own initial encounter with chaos. To ask other readers questions about The Essence of Chaos, please sign up. Gran libro, escrito con algún sesgo hacia lo personal por parte de uno de los autores que descubrió el caos como ciencia independiente. No es un libro técnico, pero al autor no le da miedo plantar de vez en cuando un sistema de ecuaciones, lo que me encanta. Se nota la mano del matemático en el estudio del caos. El libro consta de dos partes no diferenciadas. La primera es un estudio sobre un modelo en el que vemos aparecer el caos, un estudio sobre una tabla de esquí que se deja caer por una cu Gran libro, escrito con algún sesgo hacia lo personal por parte de uno de los autores que descubrió el caos como ciencia independiente. No es un libro técnico, pero al autor no le da miedo plantar de vez en cuando un sistema de ecuaciones, lo que me encanta. Se nota la mano del matemático en el estudio del caos. El libro consta de dos partes no diferenciadas. La primera es un estudio sobre un modelo en el que vemos aparecer el caos, un estudio sobre una tabla de esquí que se deja caer por una cuesta llena de bañeras, estudiando su trayectoria. En la segunda parte se trata la historia de la disciplina del caos, desde el punto de vista de la meteorología (rama del autor). El libro es interesantísimo. Por fin aprendo bien lo que es el maldito efecto mariposa. El efecto mariposa no existe. Sorprendente, estimados lectores. No existe tal y como lo solemos interpretar. El efecto mariposa lo planteó el meteorólogo Edward N. Lorenz, quien es considerado como el “descubridor” del caos, o al menos el primero que lo investigó como materia independiente. Pero lo planteó de aquella manera, no literalmente. Lorenz trabajaba con un modelo de predicción climatológica basado en un sistema de ecuaciones diferenciales acopladas (lo que técnicamente se denomina un maldito follón). Cada poco tiempo, el ordenador imprimía unos valores para las variables temperatura, humedad y dirección del viento en un punto dado. Llegado un momento, Lorenz tuvo que suspender la simulación y, al reanudarla, introdujo valores que ya tenía impresos para que el ordenador lo retomara donde lo había dejado. Pero no introdujo los últimos que tenía, sino unos anteriores. Al cabo de un rato, las predicciones que hacía el ordenador no tenían nada que ver con las que él tenía impresas en la mano. Extrañado, empezó a investigar hasta darse cuenta de que al introducir de nuevo los datos, lo había hecho usando cinco decimales en vez de los seis que usaba el ordenador. Esta leve variación de los datos había hecho que las predicciones meteorológicas fuesen cada vez más distintas en las dos simulaciones. En efecto, en sistemas complejos suele haber lo que se denomina “sensibilidad a las condiciones iniciales”. Una variación al principio hará que los datos del sistema (posición de un satélite en el Sistema Solar sometido a la atracción de más de un cuerpo, temperatura y humedad del aire en un punto dado…) se desvíen cada vez más de la predicción inicial, hasta que ambos sistemas no tengan nada que ver entre ellos. La idea que Lorenz quería plantear es que si medimos con mucha exactitud las variables de un sistema caótico y a partir de ahí empezamos a hacer una predicción, entonces los factores que no hayamos medido (como, por ejemplo, el octavo decimal de todos los factores implicados), serán los responsables de que nuestro modelo empiece a alejar sus predicciones de la realidad. Encontró un ejemplo resultón con lo de las mariposas, pero ese ejemplo ha pasado a ser aceptado como verdad universal (y, sobre todo, literal), sin que el mismo Lorenz lo hubiera dicho con esa intención. Predictibilidad: ¿El aleteo de una mariposa en Brasil originó un tornado en Texas? Por no parecer frívolo aunque sólo sea por plantear la pregunta que sirve de título, y menos aún por sugerir que podría tener respuesta afirmativa, permítanme colocarla en una adecuada perspectiva ofreciendo dos proposiciones. 1.- Si un único aleteo de una mariposa puede contribuir a generar un tornado, del mismo modo pueden hacerlo los aleteos anteriores y posteriores, como también pueden hacerlo los aleteos de otros millones de mariposas, por no mencionar las actividades de innumerables y más poderosas criaturas, incluyendo a las de nuestra propia especie. 2.- Si el aleteo de una mariposa puede contribuir a generar un tornado, igualmente puede prevenirlo. At last, a somewhat respectable introduction to chaos for anyone not repulsed by a bit of math. Lorenz may not be as polished a writer as James Gleick, but his knowledge of the field, its mathematics, and its development is unrivaled. The majority of the book is spent exploring several examples of chaotic systems in detail. The book is not necessarily packed with equations (those are saved for the appendices) but it does require some "mathematical maturity" (essentially, you must be able to read At last, a somewhat respectable introduction to chaos for anyone not repulsed by a bit of math. Lorenz may not be as polished a writer as James Gleick, but his knowledge of the field, its mathematics, and its development is unrivaled. The majority of the book is spent exploring several examples of chaotic systems in detail. The book is not necessarily packed with equations (those are saved for the appendices) but it does require some "mathematical maturity" (essentially, you must be able to read slowly and do some thinking as you go). Lorenz is not afraid to take his reader for a stroll through phase space and neither will he protect him or her from subtle jargon such as asymptotic orbits, homoclinities, and Lyapunov numbers. Though the toy examples used to explore these concepts mostly involve artificially idealized pinball machines and mogul-hopping sleds, Lorenz also includes fascinating looks at the chaotic elements of our own atmosphere, his area of specialty. I would have liked more detail on these "real-world" models, but there's just one problem: we're still not quite sure what those models should be. Meteorologists and climate scientists have been handed an unwieldy problem and Lorenz's early insights into the "sensitive dependence" of our weather only reinforced the need for reserved expectations. I picked this up because I'm interested in studying markets and technical analysis. The Black Swan talks a bit about fractals and the Mandelbrot set. One of the interesting thing about some fractals is that the part resembles the whole. In technical analysis, there are several techniques that apply to charts, and the period of the chart doesn't matter. The same sorts of things work on weekly, daily and hourly charts, etc.... Another part of technical analysis is Elliot Wave theory. Without getti I picked this up because I'm interested in studying markets and technical analysis. The Black Swan talks a bit about fractals and the Mandelbrot set. One of the interesting thing about some fractals is that the part resembles the whole. In technical analysis, there are several techniques that apply to charts, and the period of the chart doesn't matter. The same sorts of things work on weekly, daily and hourly charts, etc.... Another part of technical analysis is Elliot Wave theory. Without getting into the details, the proponents of this theory also claim that there are smaller Elliot Waves within a larger Elliot Wave. Both of these observations seem to show that, in market patterns, the smaller part resembles the larger. So I went looking for a good book on Fractals. Barnes and Noble didn't have anything by Mandelbrot (he's next for me), so I decided to learn something about Chaos, which is related. I'm glad I did. A sort of "201-level" sibling of James Gleick's CHAOS: MAKING A NEW SCIENCE (which I read and rated 5 stars, it's really good). If you want to read Lorenz's personal thoughts and explanations of chaos, as well as his enlightening perspective on (20th c.) weather modeling, this is worth picking up. There's also a nice bibliography and an Appendix with some actual math in it. 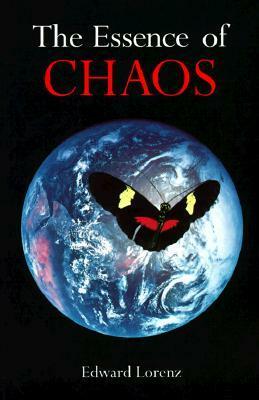 A Great Primer On Chaos Theory. Edward Lorenz takes a complicated topic and makes it accessible for all people, regardless of prior knowledge of chaos theory. He provides interesting and easy to follow examples of chaos, fractals and complexity. The illustrations are helpful and he includes a glossary of terms to aid the beginning chaos enthusiasts to quickly become familiar with the terminology. Mr. Lorenz gives a brief history of chaos and explains how it is used in the study of mathematics, me A Great Primer On Chaos Theory. I do agree with the reviews, but am perhaps a bit more positive. Here's my thoughts. The Essence of Chaos is a valiant effort to try to describe the concepts behind chaotic and limited-chaotic systems. He chose some interesting examples, but there might have been others that have greater universal appeal. He stops just at Mandlebrott just short of some of the more interesting possibilities of Chaos theory in describing social system. That's unfortunate. But, hey, it's a short book!! In Essence of Chaos (Lorenz 1993) breaks down Chaos Theory in layman's terms. 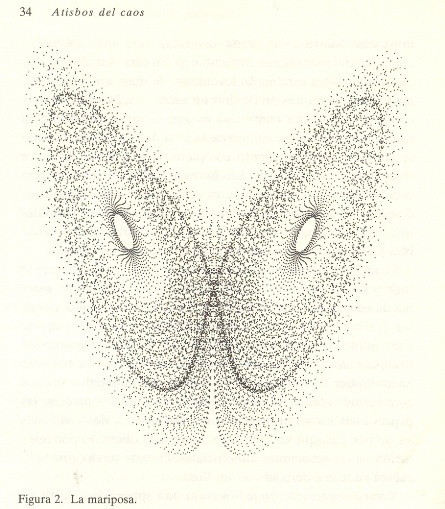 Excerpt: Appendixes present the first publication of Lorenz's seminal paper "Does the Flap of a Butterfly's Wing in Brazil Set Off a Tornado in Texas? "; the mathematical equations from which the copious illustrations were derived; and a glossary. A good book on chaos requiring and understanding of more mathematical concepts than Dr. Lorenz discusses, but he provides good examples, particularly the snowboarding ones. For the mathematical oriented readers, I found the glossary to be useful. I'm re-reading this on a lark. My youngest son sometimes brings Chaos theory to mind. :) It's a fasinating read. Don't fear the math. You can understand most of it w/out an advanced understanding of mathmatics.